William Pleasant ABBOTT [Parents] was born on 14 Feb 1867 in , Tuscaloosa, Tuscaloosa, Alabama. He died on 5 Mar 1950 in Ada, Pontotoc, Oklahoma. He was buried on 5 May 1950 in Rosedale Cemetery, Ada, Pontotoc, Oklahoma. William married Mary Adaline PERRINE on 25 Jul 1889 in Morelton, Conway, Arkansas. Mary Adaline PERRINE [Parents] was born on 22 Feb 1873 in Atkins, Conway, Arkansas. She died on 5 May 1965 in At Home Ada, Pontotoc, Oklahoma. She was buried on 7 May 1965 in Rosedale Cemetery, Ada, Pontotoc, Oklahoma. Mary married William Pleasant ABBOTT on 25 Jul 1889 in Morelton, Conway, Arkansas. 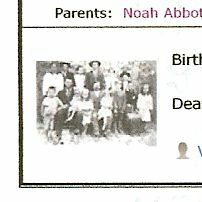 M i Noah Lee ABBOTT was born on 2 Oct 1891. He died on 9 Jun 1957. Janie E. ABBOTT was born in Feb 1892 in Griffin, Conway, Arkansas. She died in Aug 1945. F iii Melissa Adeline ABBOTT was born on 10 Sep 1893. She died on 25 Jul 1990. M iv William Andrew Jackson "Bill" ABBOTT was born on 28 Jan 1895. He died on 26 Feb 1970. M v James Matthew "Jim" ABBOTT was born on 5 Sep 1897. He died in 1974. M vi Thomas Monroe Jefferson ABBOTT was born on 5 Dec 1898. He died on 26 Oct 1972. F vii Martha Josephine "Josie" ABBOTT was born on 3 Jun 1900. She died on 29 Jun 1993. F viii Julia Viola "Dude" ABBOTT was born on 24 Mar 1902. She died before 1990. Effie ABBOTT was born on 10 Jan 1903 in , Pontotoc, Oklahoma. She died on 10 Jan 1905 in Oil Center, Pontotoc, Oklahoma. M x John Wesley ABBOTT was born on 23 Mar 1906. He died on 7 May 1965. F xi Laura Ann ABBOTT was born in 1908. She died before 1995. F xii Ninnie Pearl ABBOTT was born on 14 Mar 1910. She died in Mar 1997. F xiii Minnie P. ABBOTT was born in 1912. Harold Chester HAYES [Parents] was born on 28 Mar 1919 in Maysville, Garvin, Oklahoma. He died on 23 Mar 2003 in Payson, Gila, Arizona. 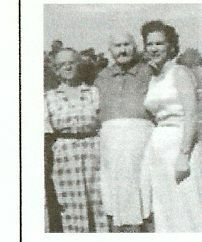 Harold married Syble CUDE on 15 Jul 1937 in Ada, Pontotoc Co., Oklahoma. Syble CUDE [Parents] was born on 29 Jul 1918 in Ada, Pontotoc Co., Oklahoma. She died on 12 Oct 2003 in Payson, Gila, Arizona. Syble married Harold Chester HAYES on 15 Jul 1937 in Ada, Pontotoc Co., Oklahoma. M i Harold Dean HAYES was born on 3 Jun 1938. F ii Rose Ann HAYES was born on 7 Jun 1942. M iii Gaylord Lee HAYES was born on 23 Nov 1945. Euval Edward HAYES "Sr" [Parents] was born on 8 Feb 1924 in , , Oklahoma. He died on 22 Aug 1987 in Tucson, Pima, Arizona. He was buried on 25 Aug 1987 in Cloride Cemetery, Tucson, Pima, Arizona. Euval married Delores Nadene BUCK on 26 Jul 1946. Delores Nadene BUCK was born on 25 Jan 1924. She died on 30 Nov 1983. Delores married Euval Edward HAYES "Sr" on 26 Jul 1946. M i Euvol "Yankee" Edward HAYES "Jr" was born on 17 May 1943. M ii Clifford HAYES was born on 8 May 1948. Debra Lee HAYES was born on 28 Oct 1950 in Phoenix, Maricopa, Arizona. M iv Victor Dale HAYES was born on 14 May 1955. Wayne Houston HAYES [Parents] was born on 20 Nov 1925 in Eldorado, Jackson, Oklahoma. He died on 13 Nov 2001 in Phoenix, Maricopa, Arizona. Wayne married Pearlie Marie WHITEHEAD on 2 Sep 1942 in Ringling, Jefferson, Oklahoma. Pearlie Marie WHITEHEAD was born on 3 May 1926. Pearlie married Wayne Houston HAYES on 2 Sep 1942 in Ringling, Jefferson, Oklahoma. M i Eddie Dewayne HAYES was born on 5 Dec 1946. He died on 18 Oct 2009. M ii Artie Gene HAYES was born on 25 Jul 1952. He died on 1 May 2004. Euvol "Yankee" Edward HAYES "Jr" [Parents] was born on 17 May 1943. Euvol married Dee. Dee. Dee married Euvol "Yankee" Edward HAYES "Jr". Thurston CLARK. Thurston married Beverly BROWN. Beverly BROWN [Parents] was born about 1924 in , , Oklahoma. Beverly married Thurston CLARK. Bennie Bert GUTHRIE [Parents] was born on 23 Aug 1933 in Sulphur, Murray, Oklahoma. He died on 20 Oct 1996 in Bellflower, Los Angeles, California. Bennie married Shirley May HUFFMAN. Shirley May HUFFMAN. Shirley married Bennie Bert GUTHRIE. M i Robert "Bob" Neil GUTHRIE. Robert "Bob" Neil GUTHRIE [Parents]. Robert married Diane Marie WHITE. Diane Marie WHITE. Diane married Robert "Bob" Neil GUTHRIE. Michael GUTHRIE was born in 1978. F ii Jennifer Marie GUTHRIE was born in 1979. Rachel GUTHRIE was born in 1981. Kathrina GUTHRIE was born in 1985. Capt. Jacob "Jake" PRICKETT "Sr" [Parents] was born in 1722 in Wilmington Mm, New Castle, Delaware. He died on 14 Apr 1797 in Prickett's Fort, Monongalia, West Virginia. He was buried on 18 Apr 1797 in Prickett's Fort, Monongalia, West Virginia. Jacob married Dorothy SPRINGER on 11 May 1745. Dorothy SPRINGER was born on 11 May 1725 in Evesham Twp, Burlington, New Jersey. She died on 21 Jan 1785 in Prickett's Fort, Monongalia, West Virginia. Dorothy married Capt. Jacob "Jake" PRICKETT "Sr" on 11 May 1745. M i Josiah PRICKETT was born on 22 Oct 1746. He died on 28 Mar 1807. M ii John PRICKETT was born in 1748. He died in 1832. F iii Mary Drusilla PRICKETT was born on 1 Mar 1752. She died on 2 Apr 1817. M iv Isaac PRICKETT was born on 1 Mar 1752. He died in Aug 1827. F v Mary PRICKETT was born on 21 Mar 1753. She died on 15 Aug 1839. F vi Martha PRICKETT was born in 1756. She died in 1818. M viii Jacob PRICKETT "Jr" was born on 1 Apr 1758. He died on 14 Apr 1826. F ix Dorothy PRICKETT was born on 21 Mar 1760. She died in 1801. F x Nancy Ann PRICKETT was born on 8 Mar 1762. She died on 13 Jul 1842. M xi James PRICKETT was born on 8 Mar 1765. He died on 28 Sep 1838. M xii Thomas PRICKETT was born about 1766. Richard "Tommy" Henderson WILLIAMS. Richard married Oleta WATTERS. Oleta WATTERS [Parents] was born on 10 Jan 1934 in Green Leaf, Hughes, Oklahoma. Oleta married Richard "Tommy" Henderson WILLIAMS.